TY8000 series electronic universal testing machine is widely used in the performance test of rubber, plastics, wire and cable, composite materials, plastic special-shaped material, waterproofing materials, metal materials. Our universal tesing equipment can do the test like tensile, compression, bending, shearing, peeling and tearing. Testing methods and standards can be customized. Utm is a necessary testing instrument for scientific research departments, universities and colleges, industrial and mining enterprises. can be tested and provide data in accordance with GB,ISO,DIN,ASTM,JIS and other international standards. Looking for ideal Adhesive Tape Peeling Testing Machine Manufacturer & supplier ? We have a wide selection at great prices to help you get creative. 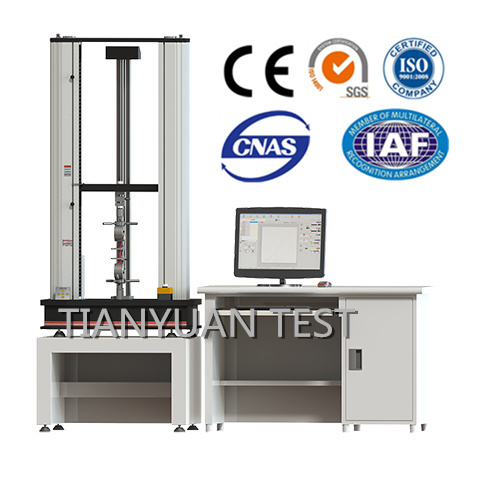 All the Plastic Tensile Test Machine are quality guaranteed. We are China Origin Factory of Non Metal Material Tensile Testing Equipment. If you have any question, please feel free to contact us.